A new service from 83 Degrees called Super Chirp launches this evening that lets Twitter users get paid for their content stream. This is a theme we’ve touched on in the past. There is a huge market for celebrity fan pages that Super Chirp will play right into. In fact, 83 Degrees CEO Narendra Rocherolle wrote a guest post here last year called A Missed Opportunity – Britney On Twitter where he talks about the idea. Twitter is mobile and it’s real time, two huge advantages over normal fan sites. And it’s constantly refreshed with new content. Britney Spears has 1.7 million Twitter followers. How many of them would be willing to pay $1, or $10, per month to see a premium stream of her content? Here’s how Super Chirp works. Unlike Twitpub, where publishers have to create a new Twitter account, Super Chirp works through direct messages (Twitter’s private message system). That means publishers can leverage their existing Twitter accounts to promote the paid streams. 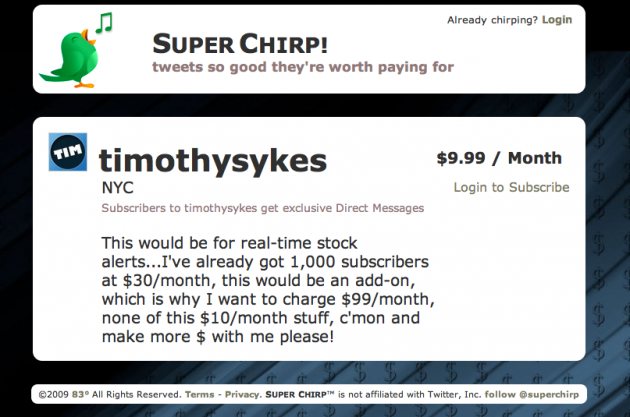 Users subscribe to the content on the Super Chirp site, pay via Paypal, and then get the messages via DM. They can also visit Super Chirp to see all those paid messages, and sort them by publisher. This is a natural product for celebrities to embrace. But it’s also interesting for charities – loyal supporters can donate to the charity and get a stream of news relevant to that charity, or whatever. Some news outlets may try to charge for streams as well. I could imagine that at least some of our followers on our main Twitter account would pay to get additional information if it had enough value. I think it’s a fantastic idea that at the very least may prove out the product for Twitter itself. If Twitter launches something like this directly, Super Chirp could become irrelevant quickly. Although, if I were running Twitter and Super Chirp got traction, I’d buy the service and port over the publishers and paying users to keep it all going. 83 Degrees is the same company that launched Power Twitter, a service I’m absolutely addicted to. You can read more about Super Chirp on the 83 Degrees blog. Update: Here’s one guy who has already signed up. Looks like he’ll be doing $9.99/month stock tips — but he’d like Super Chirp to up the range. And it looks like Loren Feldman of 1938media just signed up as well as the “funniest guy on Twitter,” for $0.99 a month. Feel free to leave your Super Chirp profile in the comments if you sign up as well and say what you will specialize in.